Respect signs that mark Snowy Plover habitat. When you visit the beach, follow all park rules. Avoid walking through dune areas. Walk low on the beach – on the wet sand – whenever possible. Exercise caution to avoid disturbing birds or trampling plants. Do not engage in active types of recreation within or near plover habitat. Activities such as kite flying, ball throwing or jogging can be perceived as a threat to plovers and can damage habitat. Do not bring pets into or near plover habitat. Shorebirds think that you and your dog are predators. Off-leash dogs can chase shorebirds, depriving them of valuable foraging and resting time and causing them to burn needed energy reserves. Dispose of garbage properly to avoid attracting predators. Raccoons, skunks, crows, ravens and other predators benefit and thrive when subsidized by human refuse. Do not feed wildlife. It’s important that we don’t feed wildlife so that the number of predators on our beaches remains naturally healthy and safe. Volunteer to participate in the plover recovery effort. By helping to protect and restore beach and dune habitat you are taking care of our environment and are showing others that beaches, dunes, and wildlife are important things to protect. Share knowledge with others. Many beachgoers are unaware of the sensitivities of the beach ecosystem. Sharing this knowledge with others will help to create a better informed public and a safer, healthier beach ecosystem for all to enjoy. Report any threats or disturbances to park dispatch at 415-561-5505. Clean-ups at Ocean Beach are conducted regularly, providing opportunities to participate in stewardship and to learn more about the beach ecosystem. 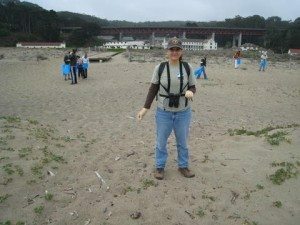 There are beach clean-up sessions at Crissy Field on the second Monday of each month. To participate, please join the SFSnowyPlovers Yahoo Group.